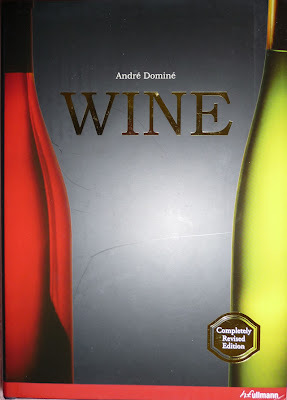 Recently I was provided with a review copy of Wine, edited by Andre Dominé. The most obvious thing about this book is how heavy it is! I put it on the bathroom digital scale and got a reading of 8.2 pounds. This is a massive volume. So is there enough substance in the book to justify the weight? I'd say definitely yes, there is. This is a work along the lines of Jancis Robinson's Oxford Companion to Wine, or Hugh Johnson's World Atlas of Wine. 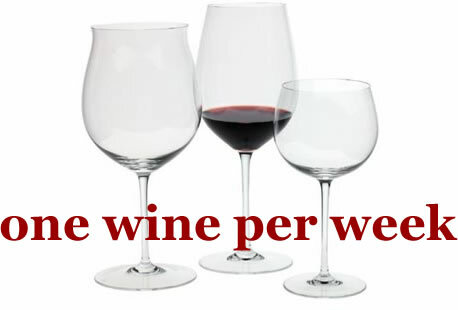 Its purpose is to present all matters and facets of winedom, and that it does. The first 140 pages of this 926-page volume deals with the history and background of wine, including an overview on tasting, handling and enjoying the elixir. The reader is also taken to the vineyards and wineries and given an education about grape growing and wine making. 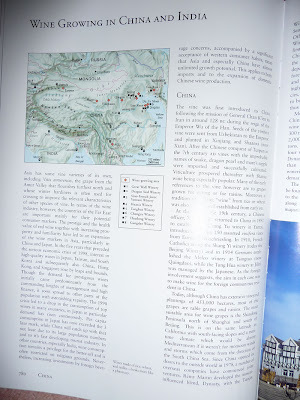 The remainder of the book focuses on what seems to be all of the wine produciing regions in the world. Rather than a textbook or encyclopedia, a book this comprehensive necessarily can't dive into too much detail in any one subject. 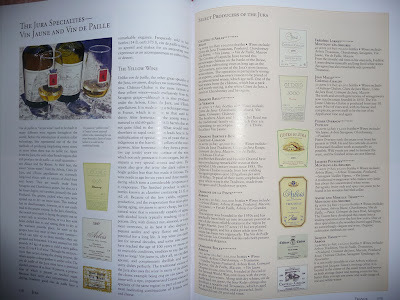 Instead, the reader is treated to an excellent overview of all the aspects of the wine world - anything you could think of, really. There are oodles of pictures, maps, charts and illustrations, making it a graphic as well as textual delight. It's really the kind of book that you'd want to pick up and randomly select a section to read on an informal basis for pleasure. There's also plenty of stats and facts if you want as well, but if you are a wine lover or want to give a thoughtful gift to someone who is, my suggestion is to give serious thought to this book. 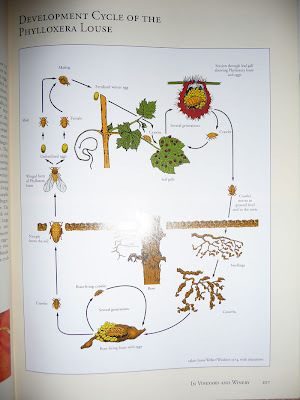 Here are a few pictures I took of pages I just randomly turned to, in order to give you some idea of the scope of the book (click on the images for a larger view). Negatives: I believe this book was originally published in German (the original title was Wein) and there is more focus given to European wines compared to other areas. North America doesn't seem to get as many pages as it should, considering its significance in the wine kingdom. Still, if one wants to pursue American wines in more detail there are plenty of other resources available. My only other criticism is that this book is so heavy! That's unavoidable, I suppose. Right now this book sells for $32.97 at Amazon ($49.95 list price) and if you ask me, that's a great price for a work of this nature. I have to remind you that I received the book gratis from the publisher who asked me to review it, and also that if you click the following link that takes you to Amazon, I get a share of anything that you purchase from them during your current visit. That isn't why I am recommending this book, though. If you are looking for a comprehsive work about wine, one that would either make an impressive gift or provide useful reading for yourself, this is one to really consider. Other than that.. I've been crazy busy lately but I plan to post some tasting notes soon. Meanwhile, I wish you all a very merry and blessed Christmas! Greetings from Colorado. According to Time Magazine, there are now wine regions in all 50 states. What do you think it will take to educate more authors and supposed experts about regions outside of California? After all, there are plenty of AVAs all across America!